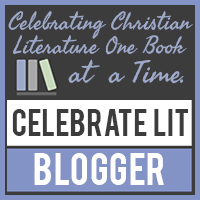 The Avid Reader: Midnight Snacks are Murder: A Poppy McAllister Mystery plus a Giveaway! 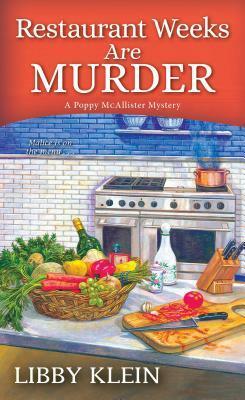 Midnight Snacks are Murder: A Poppy McAllister Mystery plus a Giveaway! Midnight Snacks are Murder by Libby Klein is the second book in A Poppy McAllister Mystery series. Poppy McAllister has her hands full with completing the renovations on Aunt Ginny’s Victorian home to turn it into the Butterfly House Bed and Breakfast, whipping up goodies for her gluten-free baking business, and keeping an eye on Aunt Ginny and her cat, Figaro. But then her mother-in-law, Georgina decides to visit to check on her investment and proves more of a hinderance than a help (as usual). Georgina has her own ideas for the B&B and is constantly undermining Poppy’s instructions to the contractor, Smitty. Thank heavens for Giampaolo and his soothing presence. Then strange thefts start plaguing the neighborhood where the thief is taking knickknacks and eating snacks. It seems Aunt Ginny’s new medications have caused her to sleepwalk. After a visit to the doctor, Poppy takes Aunt Ginny around the neighborhood offering apologies and returning the stolen items. The next day, police arrive to arrest Aunt Ginny for the death of Brody Brandt whose crime scene looks similar to those of the Snack Bandit as Aunt Ginny has been dubbed by the press. Someone is framing Aunt Ginny and Poppy intends to reveal the truth to keep Aunt Ginny out of the slammer. Poppy needs to work quickly, though, because Aunt Ginny is on house arrest which gives her too much time to plot mischief. Midnight Snacks are Murder will have you laughing the whole way through with Aunt Ginny and Georgina’s antics. While this is the second book in the series, it can be read alone. I thought Midnight Snacks are Murder to be nicely written, to have a steady pace and smooth transitions. While Poppy is the main character, she is overshadowed by Aunt Ginny, Georgina and Figaro (the cat). I like finding out more about Georgina and the reason for her behavior. However, I do not see her changing her behavior overnight. I find Aunt Ginny to be too over-the-top. She comes across as crazy instead of eccentric. I did not understand why the local cops did not just stick her in a cell and throw away the key when she kept escaping house arrest. The city had a cop stationed outside the house (no city can afford to waste manpower in that manner). I was happy that Poppy actively investigated the murder. I am surprised, though, that people were so willing to talk to her (it is New Jersey) considering she is not with the police or a private investigator. I thought it was a breeze to finger the culprit, but others may be surprised when the solution is revealed (depends on your sleuthing level). I did not like the love triangle present in the story or the amount of time devoted to romance. I felt Gia was coming on too strong and seems too perfect (of course, there is his mother). The presents he bought Poppy were considerate and expensive. I was drooling over the description of cobalt blue Viking dual fuel range (I want it). I enjoyed the ending with Mrs. Galbraith (it gave me a good laugh). A couple of Poppy’s recipes are included at the end of the book. 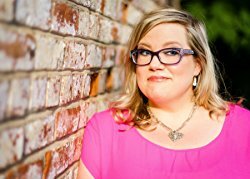 If you enjoy amusing cozy mysteries with comical hijinks, then you will not want to miss Midnight Snacks are Murder. 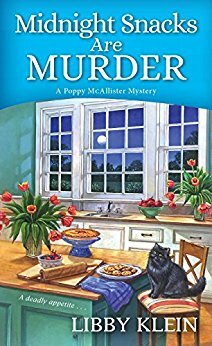 There is a preview of Restaurant Weeks are Murder (the next A Poppy McAllister Mystery) at the end of the book which comes out on February 26, 2019. The first book in this series is Class Reunions are Murder which is currently $.99 on Amazon (at least it was at the time I wrote this posting). Thank you very much for stopping by today. Make sure to enter the giveaway before you depart. You can enter via the form below or click here. The other stops on the Great Escapes Midnight Snacks are Murder Virtual Book Tour is below. I will be featuring Death on the Menu by Lucy Burdette on August 3. I hope you will visit to see what I thought. Have a charming day and Happy Reading! Books I cannot wait to read . . . .